Do you ever feel like you are being pulled in too many different directions? Do you feel like you are stretched thin and ready to snap? Is the urgent taking your time and pushing aside the important? The urgent starts to become the norm. Laundry and meals are necessary parts of a home but if not planned as part of a routine and a priority, they become part of the urgent that leaves us feeling overwhelmed. How do we stop running in circles and take more control of our lives? How do we start enjoying our lives again, loving our time with our family and living into our priorities? What is important to you and your family? What truly matters now and for the legacy that you want to leave? What memories are important for you to create for your family? What activities do you want your family to participate in? How do you define good health? How do you want to spend the days when your children are living at home? Asking yourself these questions will help you be able to define the values of your family. Now that you have defined your family values, decide how your daily tasks and projects fit into your values. Are there activities that your family is involved in but don’t really fit into your values as a family? Are you running in too many directions? Do you have enough time to create family memories and just be? Be still and be together away from the noise of the world. Sometimes it takes courage to just be still. A routine is an important part of helping you live into your priorities. Creating a schedule and routine helps you to identify what is important each day. What is part of your daily routine that you need to do daily that is helping you live into your priorities? Do you have time set aside for family time to create family memories and have meals together? Having a routine and schedule helps everyone in the family know what they need to do and how to work together as a team. Don’t forget to have some flexibility in your routine when it is needed. Have some spontaneous fun too! Sometimes I have a tendency to write too many things on my to do list and become overwhelmed. I see the big picture and all that needs to be done. Then it can look too overwhelming and I don’t get much done at all because it seems too much to do. To avoid this, I have to keep my to-do list at a minimum. Choose a few things each day that fit into our priorities that must be done to keep your home and lives running smoothly. Celebrate what you accomplish! At the end of the day, don’t concentrate on what you didn’t accomplish…celebrate what you did! Making a few changes can greatly improve the dynamics of your home and family. It can help you feel more balanced and help you stop being a frazzled mom running from one thing to the other. There are seasons when we have no choice but to just do the next thing. Life happens. When we aren’t in those seasons, live into your priorities, stop letting the urgent push aside the important so you can create a happier home and family. 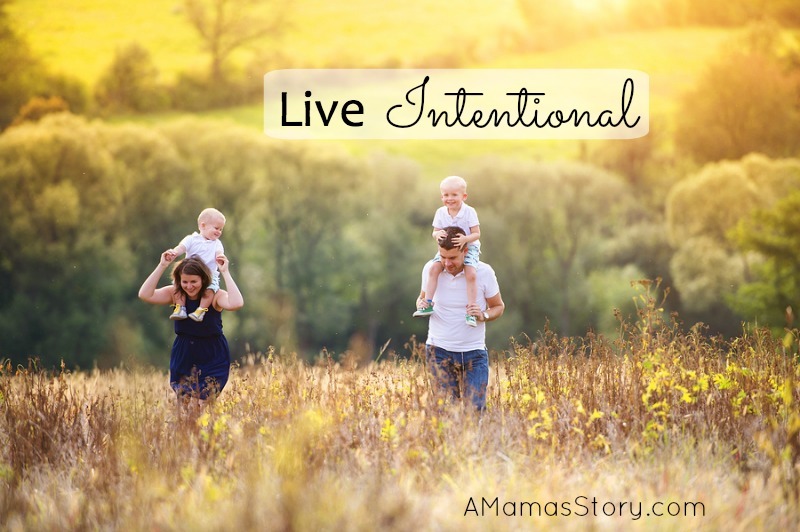 Live intentional!